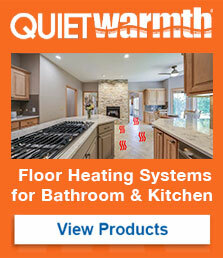 Norfolk, Neb.-MP Global Products has introduced Perfectly Warm QuietWarmth Peel and Stick Radiant Heat for Tile Floors, an in-floor electric radiant heating system for added comfort and coziness to rooms with traditional tile, stone or marble flooring. Perfectly Warm QuietWarmth for Tile Floors complements the recently launched and well-receivedPerfectly Warm QuietWarmth Radiant Heat Film for Floating Floors. Both use a unique conductive ink technology embedded in a flexible thin film and generate gentle highly efficient supplemental heat from under the finished floor covering.